Life -- indeed, survival -- was always difficult for 8-year-old Justus Uwayesu, but Sundays were particularly difficult. 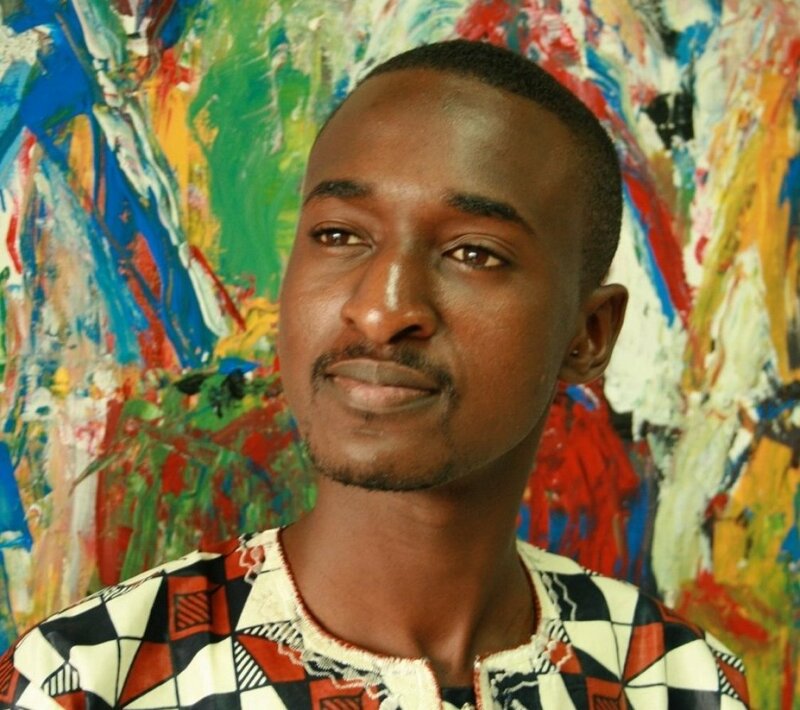 The garbage trucks did not run on Sundays, which meant his food would not be "delivered" to the Kigali City Dump where Justus lived as a double orphan. During the 1994 Genocide against the Tutsi in Rwanda, Justus' father was executed for being born into a family whose identity cards had the Tutsi box arbitrarily checked. His mother vanished shortly thereafter and no doubt met the same fate, for she never would have willingly abandoned her 2-year-old child, Justus. By the time Justus was 8, he had meandered more than 100 kilometers, ending up in the garbage dump for Kigali, the capital of Rwanda. Amid that stench was the buffet he ate from every day. His home was a stripped out, tireless car, in which he slept on and under pieces of cardboard. The car had no windows, but provided some protection from the rain and the equatorial sun, and the pigs -- those damn pigs which competed with Justus for food! They all preferred the waste from restaurants and hotels, from which Justus separated out bottle caps, toothpicks, soiled napkins, and more disgusting things, before dining on the remaining scraps of food. Then one Sunday, the traditional day of disappointment and hunger, down the dusty road rattled a taxi transporting Clare Effiong, a visitor from the U.S. and the type of "do-gooder" that seasoned development workers are quick to disparage. She was on a mission, "letting the Spirit lead" in a way that causes many to feel very uncomfortable and even suspicious. But the Spirit had led Clare to Rwanda, and on that particular day into that taxi and onto that dirt road. And when Clare saw a particular group of children (for there were many groups of OVCs -- orphans and vulnerable children), she told the taxi driver, "Stop!" Through an interpreter Clare engaged the children in conversation, asking "what do you want," and hearing the usual responses of money, clothes, etc. But when she asked little Justus, he said, "I want to go to school." Of all the OVCs in that crowd, Justus was told to get in the taxi. 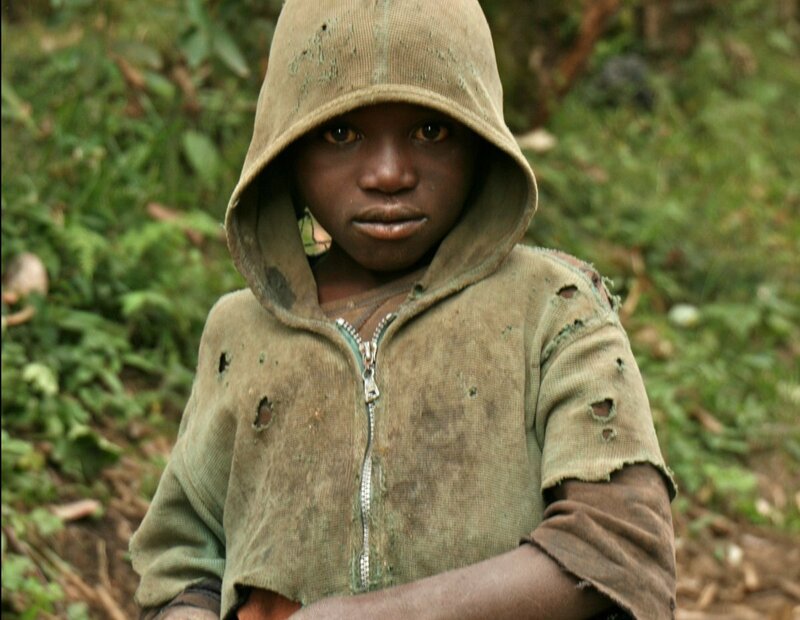 Like the Good Samaritan who took the beaten and battered traveler to the inn for treatment and rest, Clare drove Justus to a friend's home in Gikondo and told him, "Educate this boy and I will send money to pay for school fees, school materials, uniform, shoes -- whatever." From his first day of school, Justus' most distinctive attribute has been (and remains) his ever-present conviction that it is a precious privilege to learn and study his way out of poverty. When Clare pulled Justus from the city garbage dump, he spoke only Kinyarwanda. When he graduated from high school, he spoke five languages. But languages were not his focus. 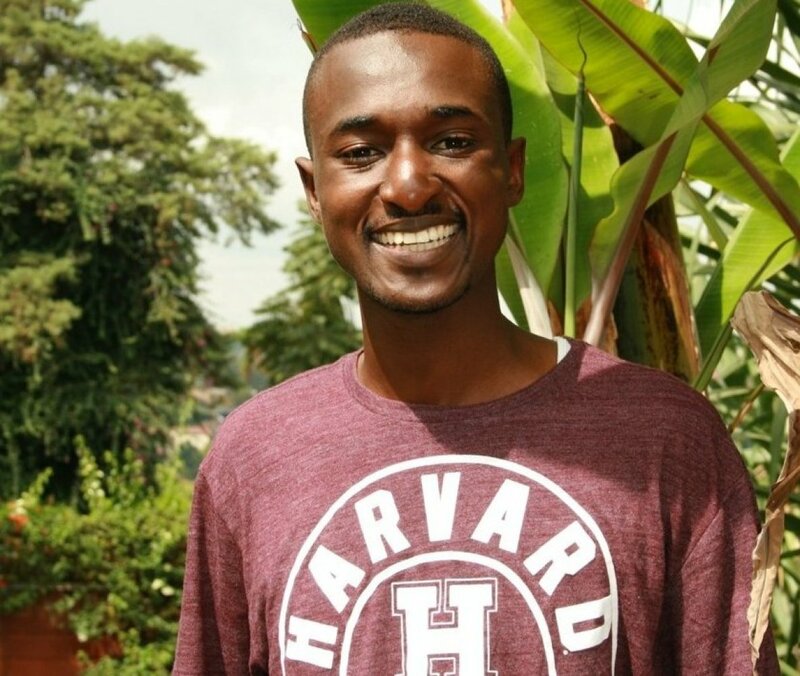 He had become a brilliant math and chemistry student and was selected to join 30 students (out of 1,200+ applicants) in the Bridge2Rwanda (www.Bridge2Rwanda.org) Scholars Program that prepares Rwanda's most gifted and promising students to successfully compete for international scholarships. Justus obsessively studied SAT and TOEFL test prep, English, research and writing, leadership, entrepreneurship, and discipleship, and received B2R's guidance in applying to colleges and universities in the United States. As all college applicants (and their parents) know, March Madness is not about basketball, but rather college admission decisions. On "decision day," at 11 PM Rwandan time (5 PM EST), Justus came to my home to use the Internet. He fumbled and struggled at first to get into the secure admissions site (while I felt my own anxiousness, knowing it would be on me to comfort and counsel Justus if the outcome was disappointment). Then the letter began to load, and Justus read the first word: "CONGRATULATIONS!" Justus screamed with joy and fell to the floor. When he composed himself, he borrowed my phone to call Clare in the U.S. "Mom, MOM!" he yelled. "I'm going to Harvard!" Justus believes, passionately and emphatically, that unmerited favor has been lavished upon him. What has been done for him, he must now do for others. If he denies the poor, he denies himself. Self-affirmation requires him to pay it forward. As I continue on my own wandering journey, I want to be like Clare and know when to tell the taxi driver "Stop!" I want the necessary discernment and courage to respond to the opportunity before me -- and to act. I'm often asked, "Why are you in Rwanda?" I have many deeply embraced answers, but after spending these recent days with Justus and other Bridge2Rwanda Scholars, I will offer this: Living in Rwanda is more thrilling than watching the best, most powerful, most emotionally rich and raw movies imaginable, and I actually get to have unvarnished, intimate conversations with the great actors as they are performing. Sometimes those conversations may even color and sharpen the performance. But whether or not I influence the performance, the performance always impacts and transforms me. I can hardly believe that I get to do this. Each day I arise with joy and wonder of yet another day. View the pictures of Justus' college-bound journey.
" I want to go to school"
Justus' new life began when, as an 8-year-old double orphan living in a garbage dump, he declared, "I want to go to school." When Justus lived alone in the Kigali city dump, he had no family or friends to take photos--so this, of course, is not Justus. But here is the all-too-common face of a child with no one. Justus believes that what has been done for him, he must now do for others. If he denies the poor, he denies himself. Bridge2Rwanda Scholars are college bound (left to right): Justus, off to Harvard; Christian, to Dartmouth; Tom Allen (author); Jonathan, also to Harvard; and Emmanuel, to U Penn. 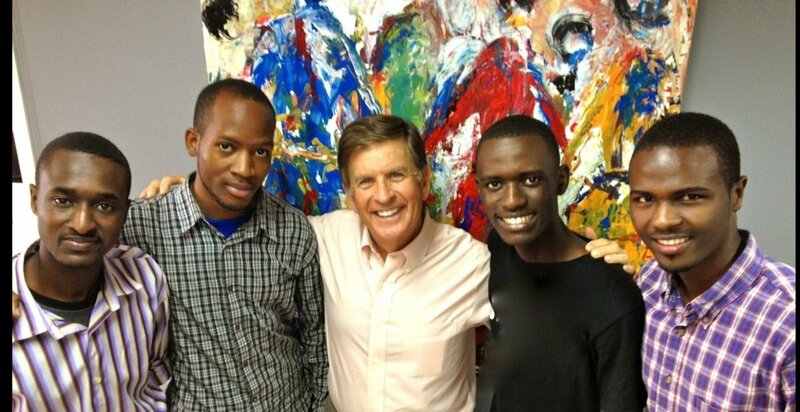 The painting in the background was painted collectively by their cohort of 27 B2R Scholars.